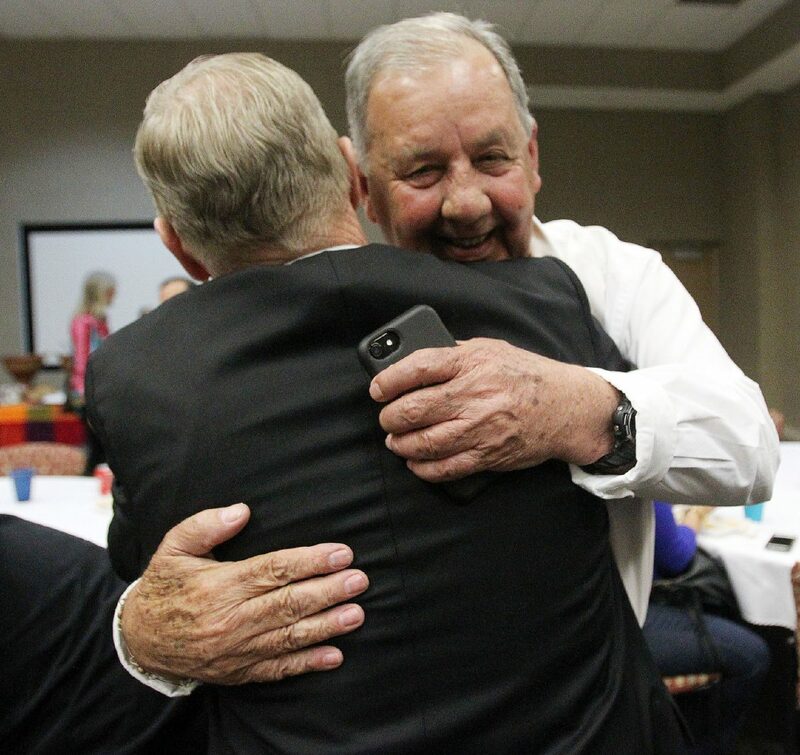 McAllen mayor, Jim Darling congratulates Richard Cortez at The Forum on Tuesday March, 6, 2018 in McAllen. EDINBURG — Former McAllen Mayor Richard Cortez appears to have defeated his Democratic opponent Eloy Pulido in the race for Hidalgo County Judge Tuesday night. Cortez defeated Pulido, a former county judge, by nearly 5,000 votes. With more than 55 percent of the vote, Tuesday night’s results showed that 24,897 ballots were cast in Cortez’s favor to Pulido’s 20,058. This now clears the path for a race pitting Cortez against Republican nominee Jane Cross, who ran unopposed in the March 6 primary. Pulido said he was “puzzled” by the early voting numbers shortly after they were announced and refused to concede until after the final numbers were announced — even though he tailed Cortez by several thousand votes at the time. The race once again pitted two old political adversaries against each other; though one of them was not running. Hidalgo County Judge Ramon Garcia and Pulido have not seen eye to eye in over two decades. So when Garcia announced he would step down from the post last year, Pulido confirmed he would run for the seat once more. Garcia, concerned Cortez didn’t have enough name recognition to win, briefly reconsidered his decision to step down before endorsing Cortez to be his successor. Linking Cortez to Garcia, Pulido said his opponent would fall in line with the same special interest groups who supported the current county judge. Cortez, however, was careful not to favor every issue Garcia supports during the campaign trail, including the construction of the new county courthouse — perhaps the biggest issue during their campaigns. Pulido had vowed to undo any progress the county made on the project in favor of letting the voters decide whether they agreed to foot the bill. Garcia and commissioners previously came under fire when they moved forward with the project rather than allowing their constituents to vote on the $150 million project. Cortez never fully endorsed the project, though he did note there was a need for a new courthouse. Instead, Cortez said he needed to further examine the issue should voters elect him.